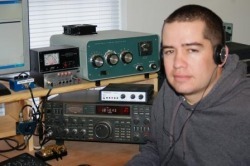 A return trip to Ocracoke Island, NC is planned July 25th through July 28th, 2013 to operate in the annual RSGB Islands on the Air Contest (IOTA). 2013 marks my 10th IOTA Expedition and 8th in a row. This is an excellent opportunity to log many different IOTA groups. Ocracoke is included in the NA067 chain. This will be a repeat of last year, as I plan to use the special event call W4O and operate from the Beachcomber Campground in the heart of Ocracoke Village. Campground manager Sean and Laurie are fabulous hosts and are Ham Radio friendly. The Camground has good food and is very affordable for camping and for hosting an RV. The restrooms are clean and there is typically live musical entertainment. This is a very down home type of place. Another special thanks goes to W4MPY QSL Card Service. The W4O Cards have been printed and it has been great working with W4MPY. I strongly recommend this company. The customer service is wonderful. You can visit the site by clicking here. As far as operating goes, I'll be on 80-10 meters using a simple Butternut Vertical for SSB and CW with a marginal ground system. I may bring a small tribander and mount it on a 20 foot mast as well. Nearly 900 contacts were made with the setup last year in 18 hours of operation. In addition to the W4O operation, good friend Jon, WB8YJF will be active from Ocracoke as WB8YJF/NA67. This year's operation will be like last year as I travel with two non-ham friends. I'm hoping for breezy conditions so that the campground will be more comfortable. Last year's WX was great for summer camping. I look forward to working as many as possible before and during the contest. 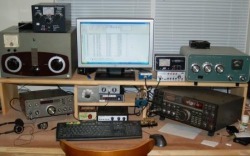 It had been several years since I last entered the January running of NAQP CW. In recent years, I've been helping the crew at N1LN operating at NC4KW. I shuffled through several of my past entries and made this year's goal to beat my all time best. My previous best (2007) was 140K with about 770 qsos. With great conditions my old personal best was easily beaten with a bottom line of 180K with 866 qsos. I may have been able to squeeze past 900 qsos with more So2R work and better management of off times, but it sure was fun. Heading into the 2011 CQWW CW Contest, I was hoping to cross over the 2000 qso mark as well as 3 million points. Both goals were met this year - thanks to very nice conditions on the high bands. 15M and 10M were super and 40M was rock solid as in 2010. My final tally included 2058 qsos and 3.5 million points running 100 watts on all bands. What a blast! This is a personal best for me in CQWW by more than 1.2 million points. I had plenty of rest heading in and I was excited about potentially great conditions â€" the propagation gods didn't let us down! I spent 39 hours in the chair this time around and I would have done more if I could have stayed awake. 10 meters was a little disappointing for me on Saturday morning, but it just kept giving on Sunday. 15M was great as were 20 and 40. 80M was sluggish from here but the highlight was working a JA on Sunday morning at sunrise. That is only the second time I have done that with 100 watts. I heard a JA on 160 but I was unable to work the station. 160 was more of a wasteland for me this year. Things were shaky before the contest began. I did a quick check of antennas on Friday morning and noticed the SWR was high on the 80M vertical. I went to the check it and one section of the T was on the ground. Not a big deal and it was fixed within 30 minutes. All was well â€" so I thought. I went out for some food in the afternoon and returned to the shack about four hours before start time. The computer was toast. No worries though, my laptop already had Wintest loaded on it and I had a few USB to serial adapters. After about 20 minutes I was ready to go again. I sure am thankful the original computer crashed before the contest! The only other issue during the contest was my 10 meter antenna oriented NE/SW broke (my fault). I took 20 minutes to throw up a dipole for 10M on Saturday and I had a backup antenna that worked fine. So thatâ€™s it â€" a grand CQWW CW is now history. In 22 years as a ham, it just keeps getting better. 73, Nate/N4YDU Station: ICOM 781 and ICOM 765 Antennas: 160M: Inverted L 80M Inverted V, T vertical 40M Dipole at 70 feet 20M 2 Loops at right angles â€" one at 60 feet, another at 80 feet 15M 2 Dipoles at right angles one at 80 feet, another at 50 feet 10M 2 dipoles, one at 80 feet, one at 40 feet Two 46 foot center fed zepps (open wire line) for all bands and second radio use (very useful antennas) K9AY RX array. While the sun is showing some signs of hope and helping propagation on the higher HF bands, I wasn't too optimistic heading into the 2010 CQWW CW contest. As usually, I entered in the Single Op, All band, low power category. I believe this is the tenth year in a row I have entered in this category. Time goes by quickly! As it turns out, conditions were super on the low bands and good enough on the higher bands to produce strong qsos totals across the hf spectrum. In the end, I finished with a little more than 1,500 qsos and a new personal best of 2.29 million points. I was particularly happy with the performance of the new W8JK wire beams. I held a nice run to Europe on 15M Sunday morning with the NE W8JK. I was hoping for some good JA activity/openings on 15M, but that never materialized for me. However, the low bands produced so well I was actually able to run Europeans the second night on 160M. That is very rare for me so it made for a nice treat and good shot in the arm when my interest wasn't the highest. I struggled with motivation the first night and went to bed about two hours earlier than I normally did. Saturaday morning was a mental struggle also, especially with a disappointing European opening on 15M and almost nothing on 10 meters. Saturday afternoon led to a new mental outlook. I took a one hour break for a nap. Follow that with a big cup of coffee and motivation was high. I worked both radios hard and the numbers began to climb. Sunday morning was another uplifiting time when I began working Europeans at a good clip on 15M and then there were several SA stations coming through on 10. Click here for the final 3830 summary. What a difference a few sunspots makes toward the fun factor. The 2010 DX ARRL CW far exceeded my expectations. Operating from home with 100 watts and wire antennas, I set a goal of 1500 qsos. The 2009 event resulted in 1260 qsos. After 41 hours of operating, the final tally was 1942 qsos and just over 1.92 million points. While 20M was solid and 15M finally opened to Europe for extended periods and produced decent rates, 40M proved to be a big bang as well. I tallied more than 500 qsos there for the first time in ARRL CW. Conditions were great and the new dipole aimed at Europe at 70 feet played very well. In the past, my 40M antennas have included verticals, half squares, delta loops and inverted vees. The current dipole is big improvement. I’m not sure why, but I strongly believe it is because of the reasonable height of 70 feet. 80M: 202 qsos and 52 countries – I grinded it out the second night on 80M. It was well worth the grind. The 80M ground plane worked well and addition of an inverted vee up 60 feet came in handy for the high angle Caribbean stations. I bagged one JA on Saturday morning for the mult. Europeans weren’t too hard to come by, but some of the qsos were challenging. 15M: 444 qsos, 76 countries – Finally! A little propagation goes a long way. There were plenty of Jas to work starting about an hour before sunset and lasting about an hour after. The Europeans were plentiful the first and second morning, although I was only able to run them for about 90 minutes each day. Day 2 produced an hourly rate near 100 high in the band. Antenna – two rectangle loops at 60 feet. 10M: 50 qsos, 19 countires – A few days before the contest, I heard a few Europeans on 10, but the conditions weren’t quite that good during the weekend. Nonetheless, the band was useful for a change and a source of some decent DX (ZS, TX4T. KH6). Bottom Line: 1942 qsos, 330 mults for 1,922,580 points. More on the station: I got the itch to get some old Ten Tec gear a few weeks before the contest. Well, I wound up with a pair of Ten Tec Corsairs. While I did miss computer control at times, it really wasn’t that bad. The receivers were great and I had almost no problems with interference between the two radios (without bandpass filtering too!). For once I had a decent assortment of RX antennas (two pennants, 250 foot beverage). The RX antennas worked well and were an asset on the lower bands. I was on the fence about going all out in the CQWW 160 CW contest and elected to throttle it back a little bit this time around. Nonetheless, I had a great time. I made it until about 3 a.m. the first night. I spent a lot of time following the local radar to see how much snow we were going to get. I went to sleep with 410 qsos 48 sections and a handful of DX mults. European signals were fair and a few answered my 100 watt cq. The second night was a little on the noisy side as storms to the south were rearing their ugly heads. The new receive pennants and the beverage antenna were quite useful. I'm pretty happy with the reconstructed inverted L as well. I moved it to a new spot to make room for a 40M antenna I have plans for. The inverted L has 3 1/4 wave raised radials. I may add more in the future. With the noise, six inches of fresh snow on the ground and a pretty wife sitting in the house, I elected to leave the shack around 10:30 p.m. and call it quits. I made a handful of qsos on Sunday afternon and finished with a grand total of 634 QSOS, 51 sections (nabbed all states but AK, HI, ND, SD and MT) and 17 countries for 106,012 points. I used a Ten Tec Corsair for the contest. Since the contest, another Corsair arrived in the mail. I sold both of my ICOM rigs (761 and 765). The Corsair performed well during the contest and I'm looking forward to using two of them for the ARRL DX CW contest. Well, I had the pleasure of operating from N1LN's fantastic station near Chapel Hill, NC. Bruce assembled team consisting of me (n4ydu), Jack (W0UCE). Alan (AA4FU) and Bruce (N1LN). We entered as Multi 2 and managed a little more than 1,600 qsos. It was a grand time. Click here to see the breakdown. After a full effort in CQWW CW, I manged only part time efforts in ARRL 160, ARRL 10M, RAC Canada Contest and the Stew Perry Top Band Challenge. I made about 150 qsos in the ARRL 160, 50 in the 10 meter contest (bad conditions), a little more than 200 in the RAC contest (mostly US and Canada in about four hours of operation, but a lot of fun!) and 120 in the Stew Perry. The Stew Perry contest was a lot of fun because I operated portable from Warren, PA from the basemen of my in-laws' house. I through up a 135 foot end-fed wire, used an old laptop using NA software and hooked it all to my ICOM 761. Everything worked out OK. The antenna was about 30 feet high and did radiate. I did not work any DX from there, but managed a VE7 in British Columbia as well as VE6 in Alberta. It was interesting to note the different propagation from 3-land. 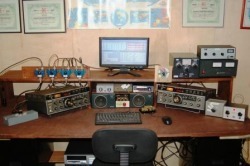 Another fun CQWW CW Contest for 2009. The past two years I've struggled to break 1 million points and a 1,000 qsos. I was over the one million point barrier before going to bed the second night. I was sitting at 950 qsos and raced to 1200 pretty quickly by noon, but the last seven hours was a painful grind, logging just 90 more qsos! Click here for the summary. At left is a picture of the new shack. I finally got to try the new shack in battle. Overall, things went well for me in ARRL SS CW this year. I managed 841 qsos and 79 out of 80 sections. This is possibly an individual high score (I'm pretty sure it is). I operated for 20 hours. I wish I shared the same excitement for SS as many members in the PVRCNC club do, but I don't. I do like handing out qsos for the club though. It's a great club building event. As far as Murphy goes...burned up a balun in a low power Ten Tec tuner (tuner cannot handle 80 meters well)...the tuner problem backlashed to the rig tuner and it is currently stuck (I think I can fix it on the IC 765)....a relay stuck in a remote antenna switch...problem went away and I hope it stays that way....resonance on 80M ground plane is too high in the band now (no idea how that happened! )....I think that is about it...time to focus on one of my favorite contests - CQWW CW...aiming for a return to the top 10 US all band LP this year...best ever finish is fourth...top five would be really nice, but top 10 would be satisfying....we'll see! The new station will get a workout this weekend in CW Sweepstakes! I'm not a big SS operator, but I'm planning on putting in extended time this year. I haven't operated seriously from home since this past July during the IARU contest. I'll be on all bands signing N4YDU using LP without assistance. Well, the fall contest season is here for sure now. I spent the better part of the CQWW SSB contest at the wonderful N1LN station. Three towers about 100 feet with stacks for 40, 20, 15 and 10 really do play well. Bruce and his wife Laurie (N1YXU) are awesome hosts. The bands were alive for most the of the test. It was really nice seeing 15M open up to Europe. We made just over 3,000 qsos and 5 million points and are holding at 3rd in the US in M/2. The K3 rigs played really well, as did the amazing beverage antennas at N1LN. Operators included N1LN, N1YXU, K4CZ, W4KAZ, N4TCP, KA1ARB and N4YDU. Click here for the 3830 breakdown. Laziness has kept me from editing my web page like I would like to. But, Below is a summary of my operating activities since the 2009 ARRL DX CW Contest. NC QSO Party: A week after going all out in the ARRL DX CW contest, I went ahead and gave the NC QSO Party a try. I spent the entire 10 hours at the desk and managed a second place in-state finish behind the talented AA4NC. Will lives about 30 miles to south of me near Apex, NC. Final qso total was 544. Of that total, 294 were on CW and the rest were one SSB. I was surprised at how steady the rates were. I'm hoping to do a similar operation next year. ARRL DX SSB: I love operating SSB sometimes, but it can be painful with 100 watts, simple antennas and no sunspots. I managed 289 qsos in 8 hours of work during the ARRL DX SSB contest for 2009. Nothing exciting to report from it. CQWW WPX CW: At the end of May, after celebrating my first year of marriage, I geared up for a serious SOABLP (Tribander, wires sub category) effort in WPX CW. I went the distance of 36 hours and posted a personal best of 2.1 million points. In that effort, I managed 1543 qsos. I logged more than 100 qsos on 10 meters, including several Europeans. I used club call NR3X during the test. ARRL Field Day: Field Day is always a fun event, and this year was no different. I traveled West to meet up with my father (N4PY) and local pals K4CZ and W4KAZ. We set up shop from Stone Mountain Park, NC. Simple wires along with a K2 and a TT OMNI VII produced 1,948 qsos using 100 watts. Both rigs did not run the entire time, but it was a fun adventure with nice weather. There was a nice 10-meter opening late at night this year to the west coast. Signals weren't big, but very workable. The general store a few miles away provided some surprisingly great Pizza! As always, it was a great joy to operate with my father as well as K4CZ and W4KAZ. IARU HF Championship: This is personal favorite of mine. The rates are usually pretty good for this one given you can operate both SSB and CW. This makes SO2R a lot of fun. Throw in the luxury of working domestic stations makes for a lot of fun. This year I went the full 24 hours, although it kind of burned me out a little bit. In the end, I compiled 1260 total qsos signing NR3X. Of that total, 833 were on CW and 422 were on SSB. 40M CW was the biggest vote getter with 323 contacts. My final score pushed a little more than 500K. Again, I operated Low Power, Single OP, All Bands from home using an IC 765 and an IC 761 with wire antennas. See station details for description. RSGB IOTA Contest: For the third straight year, W4KAZ (KAZ) and I headed to the Core Banks of NC for another adventure in the RSGB IOTA Contest. This time we had hired guns W0UCE and N3ND along with us. First of note, I actually gained weight on what is typically a glorified camping trip. W0UCE treated us to fine food all weekend. Once we got the station up and running and the glitches worked out, we were ready to sign N4A for the 24-hour event. We managed 838 qsos during the contest and had a final score of 610K. Getting to the Great Island Camp is fun. We took the Davis Ferry over and navigated the land with my friend's 4WD truck. The living conditions are fine. We stayed in a decent sized cabin that included hot water (propane powered), a toilet, shower, stove and beds. Power is provided by Keith's generator. Simple antennas were the theme again. Rates were really wonderful at times, but conditions were sluggish most of the time. We entred the Island DxPedition Category again this year. In 2007, Keith and I were fornuate enough to take home the plaque in the same category for North America. While we were tops in the US last year, we were second in NA. This year were are hoping to climb back in front. NAQP SSB: I'll try to post a report about NAQP SSB next week. I am headed to the fine station of N1LN to operate with W4KAZ, N1LN, N1YXU and others. 2009 ARRL DX CW Contest - Lots of fun! This year's ARRL DX CW contest was a thrill. I had a much more enjoyable time than 2008 simply because I made 1,260 qsos as compared to 827 the previous year. My goal of finishing in the top 10 for Single Op All Band Low Power is in good shape. Currently, according to 3830, I'm ranked seventh. I started out with the main rig on 40 and the second rig on 20. My first hour was rather slow, but things began to pick up. After about two hours I switched to 80 meters and found I could run Europeans. This is a first for me with Low Power and a simple quarter wave ground plane. 160M was in good shape too, I made the majority of my contacts on 80 and 160 the first night. Signals to Europe were very strong. Sunrise brought a strong opening to Europe on 20 meters. Calling CQ on 20 produced an hourly rate of above 80 followed by two hours near 60. 15 meters was showing signs of life as well. I managed to take advantage of the weak opening to Europe and pocket some common European multipliers. Many of these contacts were made with the second radio which was a Kenwood 450s and a simple Hustler 4btv vertical. If the vertical failed, I would switch to the 65 foot high dipole to get the job done right. The only problem with that was switching the main rig from the 20 meter run frequency. I was fortunate enough to maintain my run frequency for a long time on 20 meters. As the sun began to get low in the horizon on day 1, 20 meters opened very well to JA. I worked 31 Japan stations on 20, which is the most for me in several years. I manged two JA stations on 40 meters as well. The noisy low bands made the second night tough, as did my lack of sleep. I wanted to keep pressing, by I went to sleep around 1 a.m. local and got back up just before sunrise after a good 5-hour nap. The second morning wasn't as good on 20 meters to Europe, but 15 peaked around 1500 zulu. I was able to run 40 European stations on 15 in about 50 minutes. This was a nice treat. Signals were weak, but my 100 watts was grabbing the attention of a few stations at least. 10 meters was silent for me until 1900 zulu on day two. I worked a few quick mults and the band faded out for good. I wrapped the event up with a pass through 40 to grab a few more mults and then a final sweep of 80, 160 and then back to 20 for a few more JAs. Click here for the final score. I'm pretty tired as I type this the night before the ARRL CW contest, but hopefully I'll have a little more energy when the contest starts. I'm hoping for to be on for at least 35 hours during the contest. Last year's result was rather disappointing, so I'm hoping to topple the 2008 score in 2009. ARRL CW is one of my all time favorites. I'll be on from home signing N4YDU as a single op, all band, low power entry. Should be fun! 2009 CQ 160 CW Contest - WOW! After falling victim to a tough week, I went to bed after three hours during the first night. I managed a little more than 225 qsos, a handful of sections on just 10 countries. I got on just before 3 p.m. local time Saturday afternoon and began with a decent rate. I managed to pick up some easy sections during the daylight hours that were missed the first night. The rate meter was nice and steady. Around 10 p.m. it was beginning ot look like my country total would remain low, the score as well. at 0314Z, UA3TCJ answered my CQ. That was a nice surprise. An SP Club station followed shortly after as the east coast USA continued to come in. Things began to slow down and I was thinking the wall was here. The Europeans that called in had good signals, had to to hear my 100 watts and inverted L! I tuned around and picked off several decent mults, mostly in Europe. After about an hour of search and pounce, things were drying up. I found a nice clear spot on 1884 and rattled of a CQ- The result? OH8X called me. The 3 element monster yagi there is working! Over the next hour, 28 more Europeans called me from all over the European map. S5, YL, LY, UA3, ER0, ES, DL, F, G, ON, OK, OM, GM. In addition, a KP2 called for a new mult. The rate was still OK as the sun was rising in Europe, but I decided to go back to search and pounce in hopes of a few more mults. GM3POI was logged, as was CT9M and a pair of KL7 stations. GREAT STUFF! For the next two hours, I kept searching for a KH6. During that time I picked up North Dakota and Kansas to round out my domestic mults (missed WY, and ID). A VE7 called in as well. Finally, I heard KH6CC calling CQ and got him on the third try. That was it for the night for me. Although I wonder if I missed a possible JA opening by not waiting until sunrise. Regardless, it was a great time and a new best for me in the CQWW 160CW contest. I stopped with 779 qsos, but got on for a frantic finish on Sunday afternoon. With five minutes to go, I worked EI/W5GN for my last mult. Great fun chasing other stations on the getscores.org scoreboard!